The barnacle plots at Arroyo Hondo consist of a mixture of Chthamalus dalli/fissus (note that species were not distinguished until 2001) and Balanus glandula. Two plots are located on a smooth, nearly vertical sandstone reef outcrop and consist almost completely of Chthamalus spp. barnacles, while the other three plots are on rougher, lower sloped outcrops and have approximately 25% relative cover of Balanus. Barnacle cover varied inversely with rock as periodic scour episodes have occurred. This scour has been especially pronounced in the two plots on smooth sandstone where near 100% barnacle removal has occurred several times. The other three plots are more stable and have been encroached upon to varying degrees by a mixture of Endocladia, mussels and anemones. The average cover of these taxa has yet to meet the threshold for inclusion in the graphs. Motile invertebrate counts at this site began seasonally in the fall of 2000 and were changed to annual sampling in 2004. Within the barnacle plots, limpets and littorine numbers have remained high and reasonably steady throughout this time. Snails (Nucella spp. and Tegula funebralis) have been present in low numbers during most sampling events. Mytilus cover in the mussel plots began around 80% on average in 1992, declined gradually to under 60% through 1997, then declined precipitously to about 10% by fall 1998. After that mussel cover rebounded to about 70% by 2002 where it remained for several sampling seasons, then declined to around 50% by 2005 where it has remained ever since. Both the decline of the late 1990s and the 2002 recovery were represented by all five mussel photoplots. The subsequent cover reduction since 2005 has primarily been the result of a single plot which has exhibited very low (near zero) mussel cover since that time, with clonal anemones becoming the primary space occupier of that plot outside of bare rock. Three other plots have remained high in mussel cover, save for the occasional small breakout, while the remaining plot has been mixture of bare rock with recurring mussel patches. As with the barnacle plots, motile invertebrate counts within the mussel plots began seasonally in fall 2000 and were changed to annual sampling in 2004. 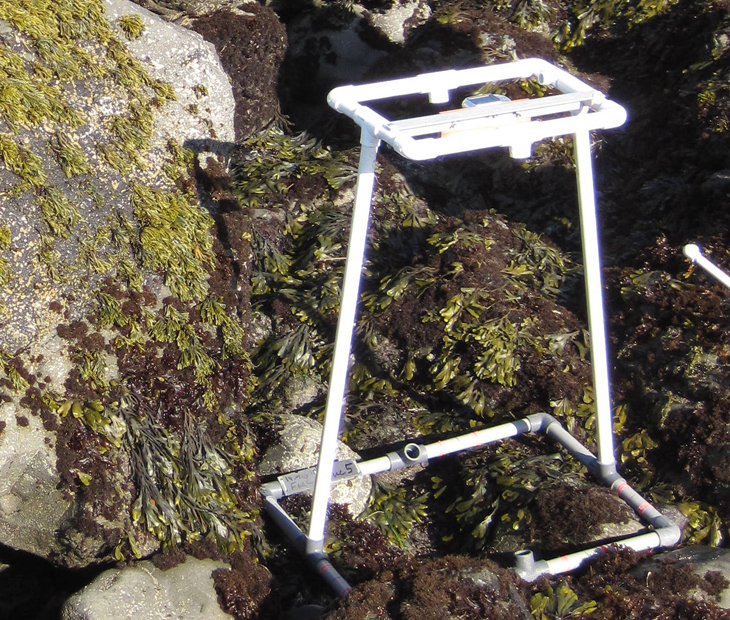 Within the mussel plots, limpets numbers have exhibited moderate fluctuations with mean numbers ranging from near zero to over 250 per plot. These fluctuations are the result of recruitment pulses of small (<5mm) limpets. The factors contributing to these pulses, and the fate of these individuals through time, is not clear. Aside from limpets, littorines and other snails (Nucella spp. and Tegula funebralis) are typically found in the plots in low numbers and chitons (Nutallina spp.) are found occasionally. Littorines have been encountered more frequently in recent seasons, though it should be pointed out that these were not consistently sampled in the mussel plots prior to 2006. 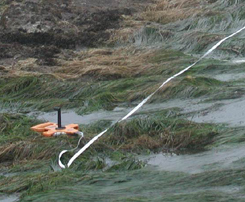 Littorine sampling ceased in 2014. Rock ("Above Barnacles") plots were added to this site in the fall of 2008 to document any upward spread of intertidal species as a result of global climate change or other factors. These plots are expected to remain dominated by bare substrates unless barnacles or other species begin to encroach upon them. Other than bare rock and a few bits of tar, a few barnacles (up to 1-5% cover in some plots) were found in most plots by the fall of 2009. These plots are subject to occasional sand burial and scour. Sand burial events occurred in the spring of 2010 and the fall of 2012; other scour events may have occurred in between our regular sampling intervals. The mean cover of Surfgrass (Phyllospadix spp.) has fluctuated widely throughout the years at Arroyo Hondo. Throughout the 1990's and up to 2002, mean surfgrass cover varied from a high of around 90% to a low of around 30%, but with cover rebounding to the higher end every few seasons or so and the long-term mean remaining around 80%. Since 2002, Phyllospadix has undergone a decline with cover now fluctuating between 25 and 60% for the last several years. Declines in surfgrass have been met with increases in red algae (mostly Chondracanthus sp. and articulated corallines). Initially, only two transects were installed at this site due to limited habitat on a single horizontal reef top. However, a third transect was added in the spring of 2001 to achieve consistency with other sites. The addition of this third transect coincides with the start of a decline in surfgrass cover at the site. Seastar (Pisaster ochraceus) numbers have fluctuated widely at this site from over 60 stars counted and measured to just a few, with peaks in 1992, 1997 and 2002. Since 2002, there has been a general decline in seastar numbers to nearly zero in 2010. In some periods, seastar numbers show some suggestion of seasonal variation with higher numbers in the spring compared to the fall. These data have historically been collected within three short transect swaths. However, in the spring of 2004, the push for methodological consistency among sites prompted the addition of a series of three large irregular plots encompassing most of the monitoring site to be sampled alongside the transects. These plots contained a higher number of stars, compared to the transect data, during their first few seasons of sampling (expected given the greater amount of area sampled), but with declines converging toward the transect data numbers in more recent seasons and likewise approaching zero by 2010. Seastar sizes have been measured since the fall of 2000. A large recruitment pulse occurred in the fall of 2001 and the growth of these stars is evident in these trend graphs. No other significant recruitment events have observed. Despite the fact that our monitoring reef is separated from other reefs by expanses of sand, it seems from our size and abundance data that stars are able to migrate to and from the reef. 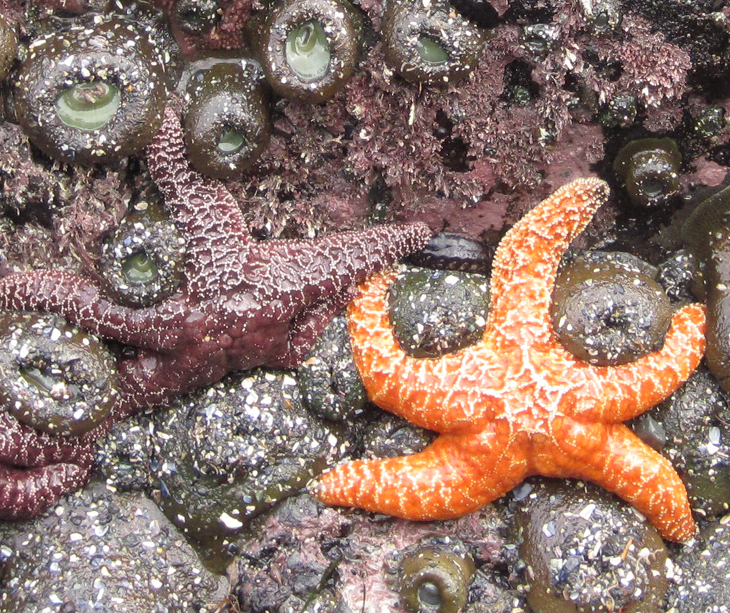 While the seastar wasting disease arrived at this part of the coast in fall 2013 and a couple possibly sick stars were observed during that sampling season, no conclusive evidence of the disease was ever recorded at this site. That said, the numbers of stars in fixed plots dropped from 10 in fall 2013 (irregular plots) to two in spring 2014 and one in fall 2014. An additional sitewide search in fall 2014 turned up three more stars. It seems likely that the disease struck this site, but did so without being detected directly.